Be the first to share your favorite memory, photo or story of Sadye. This memorial page is dedicated for family, friends and future generations to celebrate the life of their loved one. A Celebration of Life service for Sadye M. Lawson will be held on November 9th, 2018 at 3:30 PM at the Chapel of Mowell Funeral Home, 200 Robinson Road, Peachtree City, GA 30269. The family will receive visitors at 2:30 prior to the service. Sadye Marion Lawson was born October 12, 1930 to Deacon LeRoy Andrew and Elizabeth Maxine Thomas Sr. in Gainesville, Alabama. She grew up in West Newton, PA with her siblings, Maxine Bailey and Leroy, Jr. She graduated from West Newton High School, and then moved to Washington DC where she graduated from American University, College of Business, and then was employed by the Federal Government. In her travels to Europe and Japan, she met and married Walter Eugene Blaylock. They had two children, Lawrence Eugene and Lori Lynn. She participated in all their activities, and proved to be their number 1 supporter in all endeavors. This wonderful trait was passed down to her grandchildren, as she supported and encouraged them, and shared in their dreams. 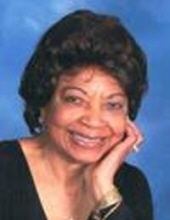 Sadye loved the Lord and joined Metropolitan Baptist Church and was part of the original Churchwide Chorus, under the direction of Daisy P. Hemphill. Later in life, she made a new home in Los Angeles, California, where she married William (Bill) Donald Lawson Sr. She worked for 20+ years, and retired as Director of Personnel at University of Southern California. After retirement, they enjoyed traveling around the world, the arts, fine foods, and sharing their volunteer ministry at Knox Presbyterian Church. Sadye was an active volunteer and member of the Juvenile Diabetes Foundation for over 20 years and shared her time, tending to the sick and shut-in whenever she was able. Her final years were spent living with her son, Larry and family, in Peachtree City, Georgia, where she attended Peachtree City Baptist Church. God peacefully called her home on November 1, 2018. She was preceded in death by her parents, her husband (Bill) of 32 years, brother (Leroy Thomas Jr), sister (Maxine Bailey), and grandson (Christopher Blaylock). She leaves behind her two children, Lori Lynn Blaylock Johnson (Antonio) and Lawrence Eugene Blaylock Sr (Chuiling); 10 grandchildren: Lawrence Jr (Anna Louise), Leah, Timmy, Mikey, Ian, Ashley, Natia, and Paige; 6 great grandchildren; 3 nieces (Karen, Diane, and Lisa), 2 nephews (Lorin and Craig), sister-in-law (Ola Kay), and godchild (Dawn). Sadye joyfully celebrated her last birthday with family and friends from near and far. She got the opportunity to smile, laugh and hug one-and-all, and we know she awaits the next celebration in Heaven. To send flowers or a remembrance gift to the family of Sadye Marion Lawson, please visit our Tribute Store. "Email Address" would like to share the life celebration of Sadye Marion Lawson. Click on the "link" to go to share a favorite memory or leave a condolence message for the family.